In the case of Bonacci v. Pal, No. 2015-CV-4501 (C.P. Lacka. Co. Aug. 25, 2017 Nealon, J. 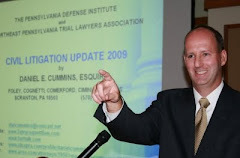 ), Judge Terrence R. Nealon of the Lackawanna County Court of Common Pleas granted a residential landowner’s demurrer in a wrongful death case on the issue of whether such a landlord may be found liable under Pennsylvania law for a fatal shooting that involved his tenant as an accomplice, but which shooting occurred miles away from the leased premises. In his Opinion, Judge Nealon reviewed the law that holds that a landowner in the Commonwealth of Pennsylvania has a duty to protect tenants and third parties from foreseeable criminal attacks on the leased property if the owner had promised or undertaken to provide certain security as an additional precaution. However, a residential property owner can be liable for physical harm to others outside of the land only if the harm was caused by the dilapidated condition of the structure or a dangerous artificial condition upon it. In his research, Judge Nealon found no Pennsylvania case which has imposed liability upon a residential landowner for criminal conduct that causes harm well beyond the geographic boundaries of the leased premises. Accordingly, since the fatal shooting at issue in this case occurred more than a mile away from the leased premises, and since the Plaintiff did not allege that the incident resulted from any physical defect in the residential structure or any artificial condition thereon, the court agreed that the Complaint failed to state a cause of action against the Defendant-landowner in this regard, and as such, the Defendant-landowner’s demurrer was granted.